Jerry Seinfeld has a new web series on Crackle called Comedians In Cars Getting Coffee. It’s not Seinfeld but in the dog days of summer you need something to watch and if it can make you laugh a little then why not. If Jimmy McMillan were running for office in Ontario, he would get my vote… for best beard on a politician. You know why? Because the rent is too damn high! I love this piece from The New Yorker - Christopher Walken in Astoria, Queens. I can’t read it without smiling and hearing Christopher Walken in my head. I never knew he was a champion hot dog eater. Nic Cage As Everyone was founded on the belief that everything in life would be better with a little more Nic Cage. I couldn’t agree more. Seriously, some of the Photoshop work on this site will keep you amused for quite some time. My wife insisted that we do a video Christmas card this year. We never send Christmas cards so I hope this video finds its way to you. Merry Christmas! I found these lyrics stuck to the basement wall where my 10-year-old son and his band mates practice. 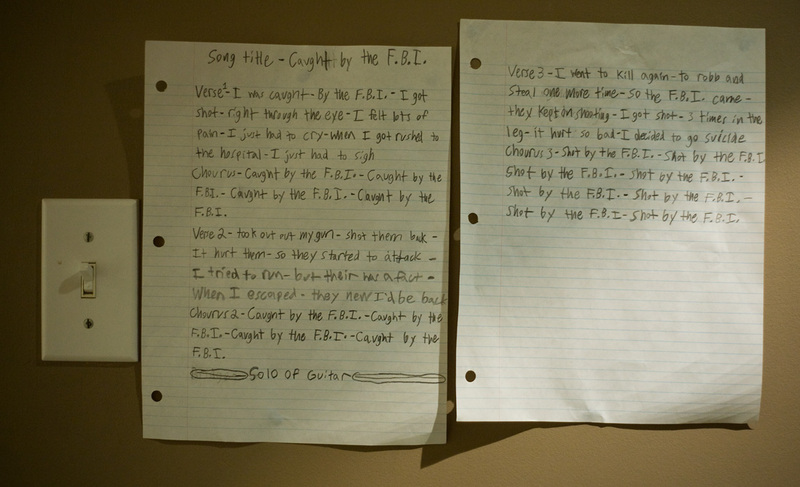 Their first song is called Caught By The F.B.I.. The lyrics that were written by his friend are little harsh but I think they’re awesome. I had a good chuckle when I read them. Call me crazy if you like. After being to the Rock and Roll Hall Of Fame on the weekend and seeing some of Springsteen’s original lyrics, I had to share this. The Slap Chop commercial with Vince is the best infomercial I’ve ever watched. This guy has his delivery down cold, the editing is tight and the cheesy special effects are classic. At about the 54 second mark he says says “you’re going to love my nuts” before he takes a handful of almonds and tosses them into the Slap Chop. I laughed my head off. Of course my 10-year-old was in the room and thinks that it’s okay to say “you’re going to love my nuts”. Occasionally I get these really funny phone messages from a friend of mine named Andy. He’s the same guy that crafted Pick Up The Phone Flippy. Andy recently left a crazy voicemail message that I call Speakerphone! Turn up your volume and press the play button below to listen in. A while back I told Andy that I wasn’t a fan of the speakerphone (he loves them). I prefer to pick up the phone and talk through the mouthpiece. Sometimes a speakerphone cuts off the beginning or ending of a sentence making it difficult to follow a conversation. The woman on the speakerphone message is Andy’s wife, Lisa. She’s not as crazy as Andy but in a few more years I think she’ll be completely mad. I’ve heard Speakerphone! at least 20 times and somehow it still makes me laugh. Telegraph in the UK has published the funniest complaint letter I’ve ever read. The letter was sent to Sir Richard Branson by a passenger on a Virgin flight to India. Apparently they were dissatisfied with the in-flight meals and entertainment. Funny stuff. Here’s a sneak peek at Ricky Henderson’s Hall of Fame plaque. Cheeky to say the least. Remember the Wassup Budweiser commercial from 8 years ago? The boys are back. True. It turns out that I was wrong. Being a television news reporter can be very dangerous! Gawker has a fabulous compilation video of some bizarre and very funny clips from over the years. I’ve watched the video five times and I’m still busting a gut. My favourite is the reporter that gets attacked by a snake. The old man that gets attacked by the dog is a close second. I’ve been in at least a dozen team photos but this is by far the best team photo I’ve ever seen. Pure magic! Think of the poor kid in the second row. This image popped up in a video presentation by Cabel Sasser of Panic. If you’re at all interested in application design, Panic, or indie Mac developers then you’ll find this video really interesting and geeky in a good way. Imagine walking through Grand Central Station and all of a sudden 200 people just stop moving. That’s exactly what an improv group did and they stayed frozen for 5 minutes. Watch the video and watch the reaction of people as they try to figure out what is happening around them. The next US election is less than a year away which means things are about to get ugly. The Really Truly Hillary Gallery is a collection of very unflattering photos of Hillary Clinton that make her look like a crazy old lizard. Oh, and many of them are quite funny. I just came across the “blog” of “unnecessary” quotation marks which has been “making fun of bad punctuation since 2005”. It’s a very funny blog and it has some great examples of how not to use quotation marks. Apostrophe Abuse is another very funny site that documents the incorrect use of the apostrophe in signs, websites (NY Times), movie tickets (Alien’s), television and more. Cadbury in the UK has produced “a mintue and a half full of joy” or a very funny gorilla movie. Link via daringfireball.net. Yesterday I saw a bumper sticker that made me laugh out loud. I am ready to kill myself and eat my dog, if medicine prices here (http://washfoot.hk) are bad. Look, the site and call me 1-800 if its wrong..
Gene Simmons of KISS just had a facelift and it isn’t pretty. You’ve been warned. Has there ever been a president more out of touch with reality. I can’t stop laughing after watching ‘W’ on this CNBC clip. Here what he has to say about ‘The Google’. One of the things I’ve used on the Google is to pull up maps. It’s very interesting to see — I’ve forgot the name of the program — but you get the satellite, and you can — like, I kinda like to look at the ranch. It remind me of where I wanna be sometimes. I’d be willing to bet money that ‘W’ doesn’t use email. I wish the CNBC host asked him if he uses Firefox. Now that would have been an interesting answer. Imagine being able to travel around the world for free. The catch? You have to videotape yourself dancing like a fool in every country that you visit. That is what Matt did. Watch his video here. Thanks to “the lovely” for the link. Hey, Mel Gibson, HOW’S REHAB? On Tuesday night, Denis Leary joined the guys in the broadcast booth for part of the Boston Red Sox game. When Leary found out that first baseman Kevin Youkilis was Jewish he went on a Mel Gibson tirade. While Leary was slamming Gibson, Kevin Youkilis made two great plays and Leary went nuts! Funny stuff. The editing in Jimmy Kimmel’s Unnessary Censorship is brilliantly funny! Grupthink is compiling a list of easily mispronounced domain names. A few companies need to fire the marketing department. Number 1 is TherapistFinder.com or TheRapistFinder.com depending on how you look at it. Number 2 is Pen Island with the address Penisland.net. You get the idea. Funny stuff. Best Week Ever Blog has The Lost Mac Ads starring Christian Finnegan and Nick Kroll. Very funny stuff. Thanks to Jason for the link. Philips has a new ad campaign for their Bodygroom product which is hilarious. Go to shaveeverywhere.com and have a laugh. The video intro is risqué and quite funny. Click on the MAIN MENU and view the music video for more laughs. Hey, isn’t father’s day coming up? I wonder if the wife is reading this? Joe Volpe is campaigning for the Liberal party leadership in Canada. Last week he was questioned why he accepted $27,000 from the children of some drug company executives. Do you know any kids that would willingly give thousands of dollars to a politician rather than spend the money on video games and toys? I didn’t think so. It looks like a few of Joe’s friends took advantage of some loopholes in the way political donations are accepted. Poor Joe gave the money back to the kids. Somebody set up website called youthforvolpe.ca to embarrass Joe but he had it quickly removed. Unfortunately for Joe the site popped up again in the US and you can view it at youthforvolpe.net. Volpe works hard and likes to eat well. If you or your children feel inspired to help Joe then send him your hard earned cash. Somebody needs to replace Mr. Dithers and it might as well be Joe. Judson Laipply, an inspirational comedian (whatever that means) performs the Evolution of Dance. I found Police vs Darth Vader - Round 1 via one digital life. It doesn’t matter that the video is in Japanese because it is quite funny and needs no translation. Google Video has the Super Bowl XL Commercials from last night. No need to pay adcritic.com to view these television commercials. Google has them for free! Is this your can of STUD 100? If so, it was last spotted at the old court house building in downtown Pittsburgh. I can’t believe that somebody makes this stuff. I wonder how long it will be before I start getting spam for this stuff. There is a larger photo on BOMBIPPY PHOTOS. Here is a video that illustrates why your grandmother shouldn’t go skydiving. Video requires Windows Media Player. When I had the guys over for the Super Bowl on the weekend, the Ameriquest commercials received the biggest laughs. My favourite is the guy making a dinner for his wife when things go horribly wrong. If you missed any of the Ameriquest commercials then you can watch them here. Ford created this hilarious commercial (Windows Media Player required) for its European Sportka model. Cat lovers were not amused and I’m sure that some thought that this was commercial was real. Are people really that stupid? Haven’t they heard of special effects? Enjoy. This weekend I went with a few of the boys to a Nascar race at Michigan International Speedway. On Saturday night we went to The Bone Yard for some BBQ ribs. We usually go to a sports bar called Kickers afterward but it was closed due to the power blackout. So how do four Canadian guys amuse themselves in a Detroit suburb on a Saturday night? They go to a Seven Eleven and purchase some chewing tobacco. Then they drive around until they find a small town called Farmington which resembles Mayberry from the Andy Griffith Show. Below is my recollection of what happened between 8 PM and 10 PM that night. My friend Gary is the first to try some Wintergreen flavoured Kodiak Smokeless Tobacco. He takes a very small pinch and puts in his mouth. Real men chew tobacco so I take a small pinch out of the can and carefully place it in my mouth. The other two guys with us, John and Russ think we’re crazy and refuse to try. Naturally, I tease them and repeatedly call them a bunch of wimps. Gary warned me that my mouth would start to salivate right away, which it did. He also said I would get a buzz from the nicotine but I wasn’t feeling anything. “Give it some time,” he said. He also warned me not to swallow any. We wandered around the town for a little, spitting tobacco, looking for a place to get a pint. I was getting bored with this little piece of tobacco and decided to put a much bigger wad in the side of my mouth—the same way major league pitchers do between innings before they head back to the mound. We approached the main street and in less than a minute I began to feel light-headed. Then I began to feel dizzy, unstable, reaching for the side of buildings to balance myself. I wobbled over to a park bench across from the movie theatre and sat down as my head begin to spin. I spit out the tobacco. I was amazed at how fast it affected the rest of my body. The other three guys were killing themselves with laughter as I began to keel over on this bench. I was beginning to feel nauseous and worried about the huge slab of BBQ ribs I had earlier. Too late! I asked the guys to stop laughing and help me up. I was going to be sick. I looked around and saw a pot of geraniums beside a building. Leaning against the building with one hand I bent over and emptied my dinner on top of those geraniums. A family out for ice cream walked by. I didn’t notice them but the guys assured me that this family was not impressed with my abdominal strength. They probably assumed I had a few too many pints at the pub across the street. I fertilized the geraniums for a little while and sat back down on the bench in disbelief. Feeling dizzy and hot from hurling, John found some cold bottled water for me from one of the nearby stores. I noticed that Gary was buckled over as well but it was from laughing so hard. I was the entertainment for the evening. As if things couldn’t get any worse, I realized that a severe case of diarrhea was about to finish me off. I sprang up and staggered around telling the guys that, “I need to find a bathroom! Now! I’m not kidding guys! I gotta go! !” John found me a washroom in the pub across the street. I was relieved. The stall was occupied. John tried the door a few times when I voice said, “I’ll be just a minute.” That minute seemed like an eternity. I found relief in the washroom and wandered out to the bar where they guys were still laughing at my stupidity. The smell of food made nauseous again and I staggered outside. I had to vomit again but my pot of geraniums was across the street and the light was red. I didn’t care. I ran out into the street in front of a pickup truck that stopped to let me pass. Right in front of the truck I projectile vomited into the street—a first for me. I found another bench down the street and sipped my water for the next hour while they guys had a beer in the pub. Back out our hotel, I cleaned up and went to bed. Passed out is more like it. After great embarassment, I can now say that I have experienced chewing tobacco, that it is a disgusting habit and that I’m not a real man. I’ve got a friend who is the principal of a school. I can’t say where for obvious reasons. He recently had a bizarre meeting with the parent of a grade 8 student. This mother wanted her son to fail the year. My friend disagreed with her. This student’s mother tried to convince my friend that her child was an idiot and must fail! Huh? Who’s the real idiot here? My friend tried to determine what some of this boy’s skills were and asked if he was mechanically inclined. The mother said that he was not and mentioned something about the number of VCRs that he had destroyed. The parents once gave him a broken VCR to tinker with and made sure the power cord was removed. There was a concern that he might electrocute himself by forgetting to unplug the VCR from the wall first. It seems that there was an episode where this kid was watching TV and the set stopped working. He thought he could repair the set and proceeded to cut the power cord while the set was on and plugged in! I don’t know how my friend kept a straight face through all of this. This definitely tops his story about the fat kid who was stealing a little girl’s lunch everyday. This poor mother kept providing example after example of her son’s stupidity but it looks like little Billy is going to graduate. I’m sure we’ll read about him in the papers next year after he attends a few classes in machine shop or chemistry. Stay tuned.